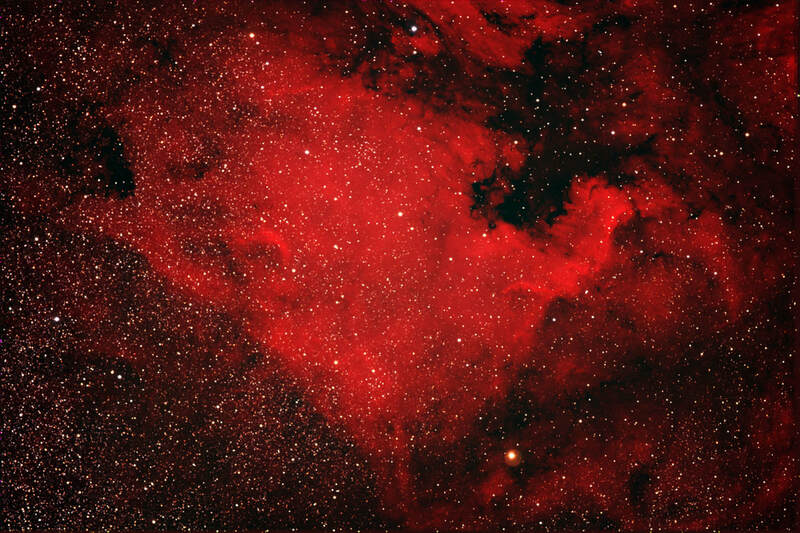 The images which follow were taken with a Takahashi 106 FSQ coupled to an SBIG STL-11,000. This results in an incredible FOV of 156 by 233 arc-minutes with an image scale of 3.5 arc-seconds/pixel (perfect for our New England skies). Many of these images were taken before the RCOS-16 was fully functional and most were taken by stacking 10 minute unguided exposures (depending on the amazing accuracy of the Paramount ME with T-point modeling and PE correction). These images were the first I have taken using Paramount ME mount, and represented a significant change from my previous work with a SCT. The goal was, and continues to be, to produce higher quality images. "Higher quality" is a relative term, but it is hoped that there will be, over time, an evolving improvement in the overall quality of the images, especially with regards to signal to noise ratios and overall processing techniques. New details of image acquisition and processing will be discussed when the changes are relevant to the image. Many thanks to John Smith (astro-imaging consultant, author of DDCAutoPilot and PremPro), Ron Wodowski (for "The New CCD Astronomy") and the 2004 Astro-Imaging Conference. ​Programs in use include Software Bisques "The Sky" (telescope control), Focus-Max (automated focus with this program and RoboFocus), CCDSoft (camera contol), Mira AP (image calibration and registration), Maxim DL (further processing and color stacking) and Adobe CS (final image processing). John Smith's CCDAutoPilot is a remarkable program which is used to automate the image sessions (the telescope runs all night while the user sleeps). ​Please Note: This is not an "Astro-Gallery" of "perfect" images. It's a work in progress. The initial images will utilize a Takahashi 106 FSQ, with a wide FOV (at 156 x 234 arc-min) and an image scale of 3.5 arc-sec/pixel (with an SBIG STL-11000). The unsaturated stars in these images will pixelate quickly with the zoom function (too few pixels per star). Later (hopefully by March of 2005) an RC-16 will be used with a sampling of about .7-.8 arc-sec/pixel (using an ST-10 XME with a .7 FLR, or an SBIG STL-6303). The FOV will decrease but hopefully the quality of the image will improve. With each image I will leave a "Note" describing what huge errors I've made (count on it happening) with that image, or what new technique I've learned. Hopefully as a chronical, this "Astro-Gallery" will be helpful to others. This is the last of the images taken on the LX-200 platform. 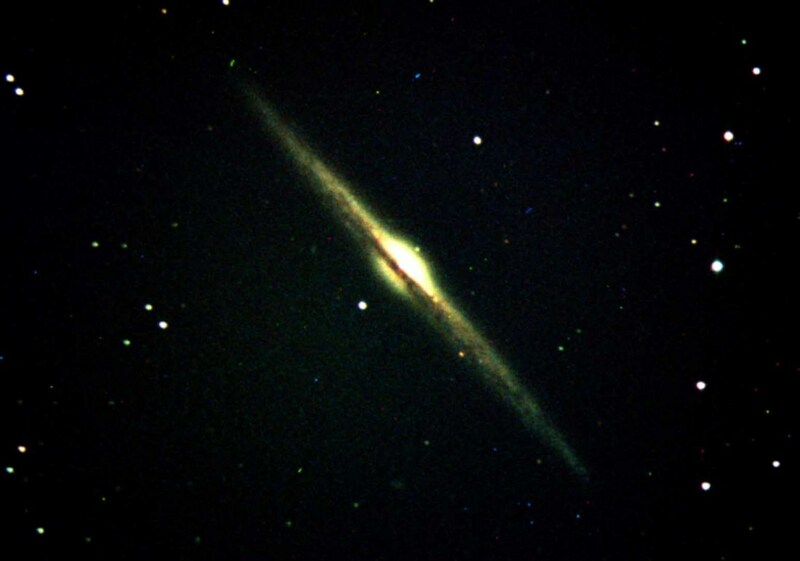 NGC 4565, a stunning edge-on spiral galaxy in the constellation of Coma Berenices. This galaxy all but knocked me over the first time I saw it. 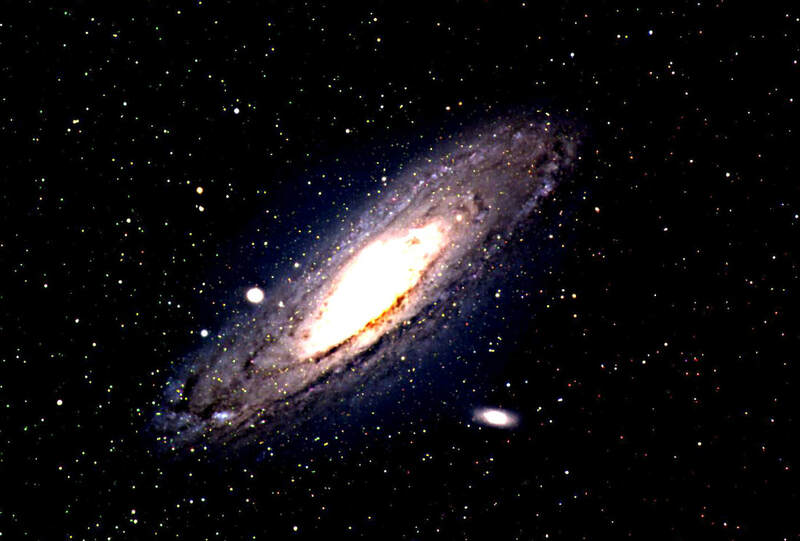 Its about 31 million light years distant and has a length of 125,000 light years. Theres a beautiful "dust" lane which covers about two thirds of its' length. Note the bright star touching the southwest edge (south is up in this image) of the central core. Imaged with the GPS 12" LX-200, using SBIG ST10-XME, AO adapter and 6.3 FL reducer. Processed with CCDSoft (including RL deconvolution) and Adobe Photoshop (KBQ, 03/29/04). Note: All's I can note here is to consider reading Ron Wodowski's book and give a great deal of thought to the importance of a steady mount as being even more important than having a large aperture telescope. This page marks a transition in our observatory. 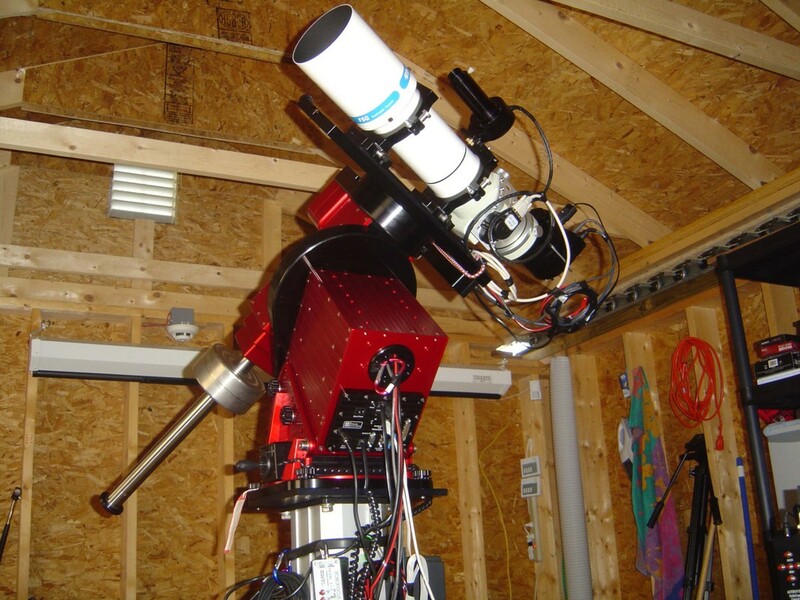 It marks the demarkation of going from the LX-200 to using the Paramount ME Mount, initially with a Tak 106 refractor (later with the Tak-106 and and RC-16). Although the GPS LX-200 is a wonderful telescope for observing and video imaging, many (including myself) have found guided CCD work very difficult with the LX-200 due to inherent 'sloppiness' in the RA and Dec gears (I've called, but could not get any data on the expected periodic or random errors for the LX-200). Some have succeeded by working at reduced focal lengths, by using an AO adapter, using SBIGs patented "Track and Accumulate" methodology and even by replacing parts of the RA and Dec gears (I've had 'some' success using all 4 tactics). I've learned much from this telescope and will continue to enjoy and praise it as an wonderful observing and video platform at star parties. Although we are still waiting for the RC-16, the images which follow will be those taken with the Tak-106 atop the Paramount ME, using either and SBIG ST10-XME or large format SBIG STL-11000. We are using John Smith's CCDAutoPilot and most of the newer processing methodologies come from his advise. 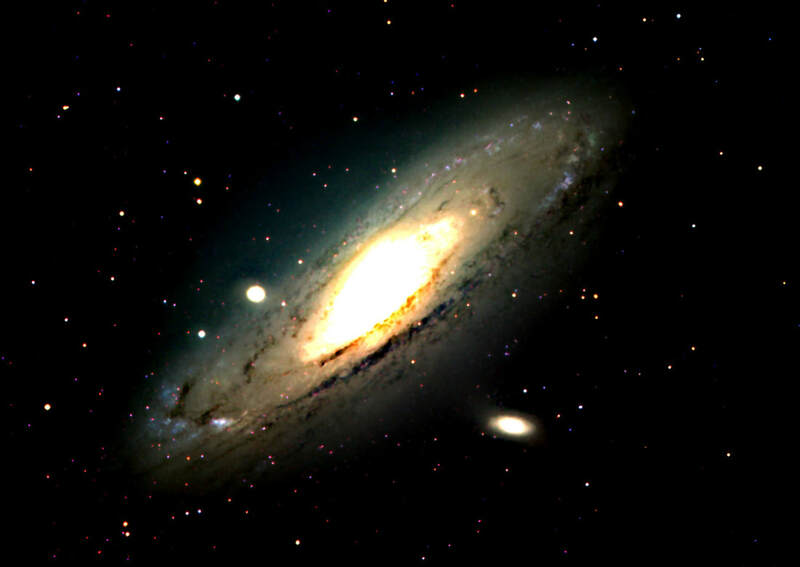 M-31 (NGC 224), Great Galaxy of Andromeda, with associated galaxies M 32 and M 110. Located 2.2 million light years distant and part of our Local Group of galaxies. Notable as being the site where Hubble discovered the Cepheid variable which put this "nebula" out of our own galaxy, thereby beginning the process of discovereing that many so called "nebula" were actually "island universes" (galaxies"), each made up of billions of stars. This dramatically changed our picture of the universe and our (very small) place in it (up until then the theory of Shapley and others indicated that the entire universe was enclosed in our Milky Way galaxy, less than 100,000 light years in diameter). Imaged with Tak-106 with paramount ME on a hazy night with an SBIG STL-11000 and CCDSoft. Assembled from 4 separate 10 minute R,G and B images each (taken with CCDAutoPilot); dark subtracted and aligned with Mira AP-7, color processed with Maxim DL and Adobe Photoshop (KBQ, 10/04.04). Note: Over-processing has burn out core. More images to increase the signal to noise ratio and less unsharp masking would have produced a better image. Once again, M-31 (NGC 224), imaged just one day later and processed in a slightly different manner. As with the previous CCD image, this was imaged with an SBIG STL-11000, using the Tak-106 with paramount ME, again on a hazy night. Imaging performed with John Smith's CCDAutoPilot, using CCDSoft for camera control (-15 deg C), with 3 separate sets of 2x2 binned 10 minute R,G and B images (20 darkframes assembled for reduction). Image processing included alignment with Mira AP-7, color processing with Maxim DL (version 4), and touch-up with Adobe Photoshop CS (including use of the Medium Noise Filter). (KBQ, 10/05/04). Note: The heavy use of the median filter in Adobe Photoshop has given the galaxy an interesting but unrealistic appearance. 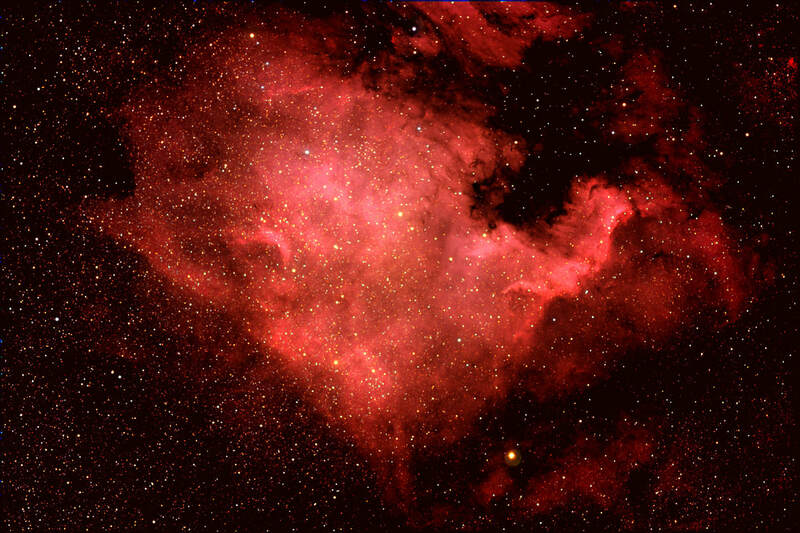 My first try at NGC7000, the North American Nebula, located in Cygnus and illuminated by Deneb. Imaged with an SBIG STL-11000, using the Tak-106 with Paramount ME. Imaging performed with John Smith's CCDAutoPilot, using CCDSoft for camera control (-25 deg C), with 4 separate sets of 2x2 binned 10 minute h-alpha, R,G, and B images (20 darkframes assembled for reduction). Image processing included reduction and alignment with Mira AP-7, processing with Maxim DL version 4 (color combine and DDP) and Adobe Photoshop CS (KBQ, 11/08/04). Note: Using the H-alpha channel as a L channel brings out the details (ie, ionized hydrogen emissions), but causes an incorrect colorization which is difficult to correct. See discussion in future images. A second reprocessing of NGC7000, the North American Nebula. Here the H-alpha filter results have been colorized in violet, in order to accentuate other details of the ionized hydrogen emissions. Imaged with an SBIG STL-11000, using the Tak-106 with Paramount ME. 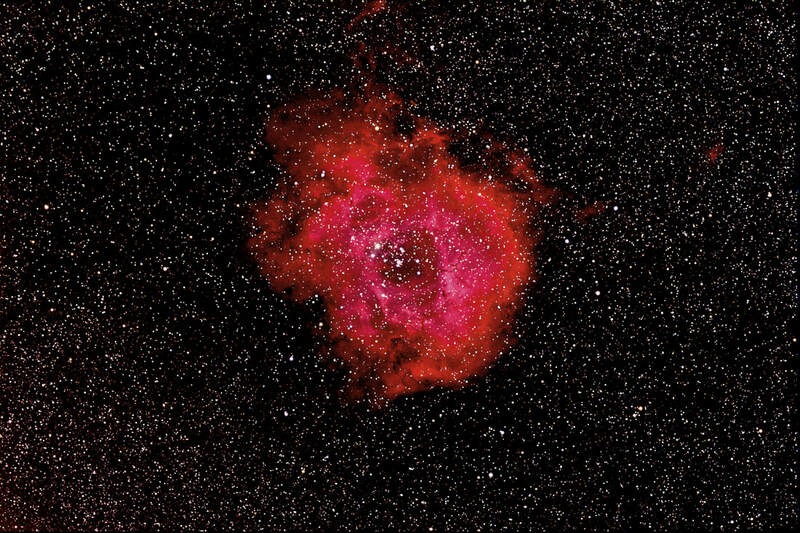 Imaging performed with John Smith's CCDAutoPilot, using CCDSoft for camera control (-25 deg C), with 4 separate sets of 2x2 binned 10 minute R,G, B and H-alpha filter images (20 darkframes assembled for reduction). Image processing included reduction and alignment with Mira AP-7, processing with Maxim DL version 4 (histogram/curves and color; including H-alpha violet pseudocolorization with colorstack) and Adobe Photoshop CS (overlaying of RGB and H-alpha and touch-up). (KBQ, 11/08/04). Note: Maxim DL has some great features, such as "color stack", which allows one to choose a color for each filter. This is a reasonable approach when using H-alpha and other "narrow band" filters, since there is really no "true" visual equivalent for these narrow wavelengths. The appearance is not, however, true to "the eye", so to speak. 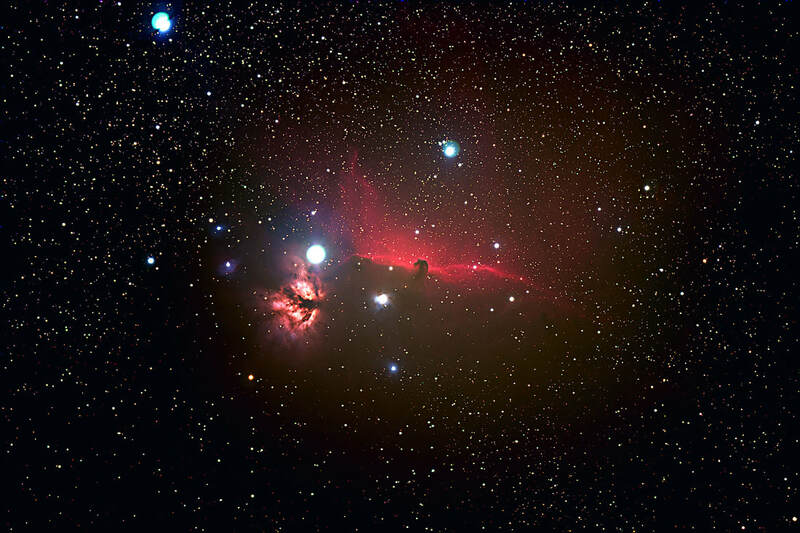 Wide field image of the horsehead nebula and its' associated reflection nebula IC 434, with attention paid to not "burning out" this reflection nebula. Imaged with an SBIG STL-11000, using the Tak-106 with Paramount ME. Imaging performed with John Smith's CCDAutoPilot, using CCDSoft for camera control (-15 deg C), with 6 separate sets of 2x2 binned 10 minute H-alpha, R,G, and B images (20 darkframes assembled for reduction). Image processing included reduction and alignment with Mira AP-7, processing with Maxim DL version 4 (color combine and DDP) and Adobe Photoshop CS. The H-alpha channel was treated as a 30% luminance channel (KBQ, 11/08/04) Note: Again, using the H-alpha as a stand alone Light channel does produce an unnatural salmon or orange appearance to the image. More about this coming up. 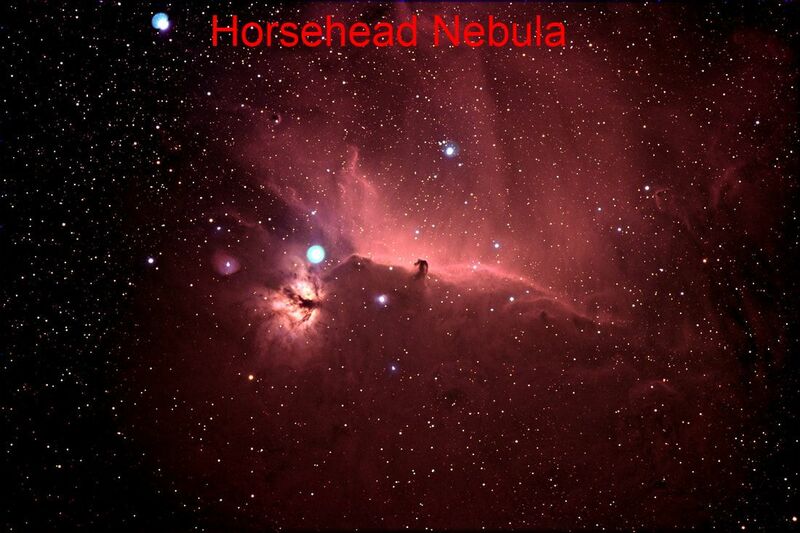 The same image of the horsehead nebula and its' associated reflection nebula IC 434. Also imaged with an SBIG STL-11000, using the Tak-106 with a Paramount ME mount. Imaging performed with John Smith's CCDAutoPilot, using CCDSoft for camera control (-15 deg C), with 6 separate sets of 2x2 binned 10 minute H-alpha images alone (20 darkframes assembled for reduction). Image processing included reduction and alignment with Mira AP-7, processing with Maxim DL version 4 (DDP) and Adobe Photoshop CS (histogram, curves and unsharp mask). (KBQ, 11/08/04). Note: The H-alpha channel alone produces a nice monochrome image not dissimilar to a black and white image (with all the additional detail produced by an H-alpha filter). Another technique in processing NGC7000. 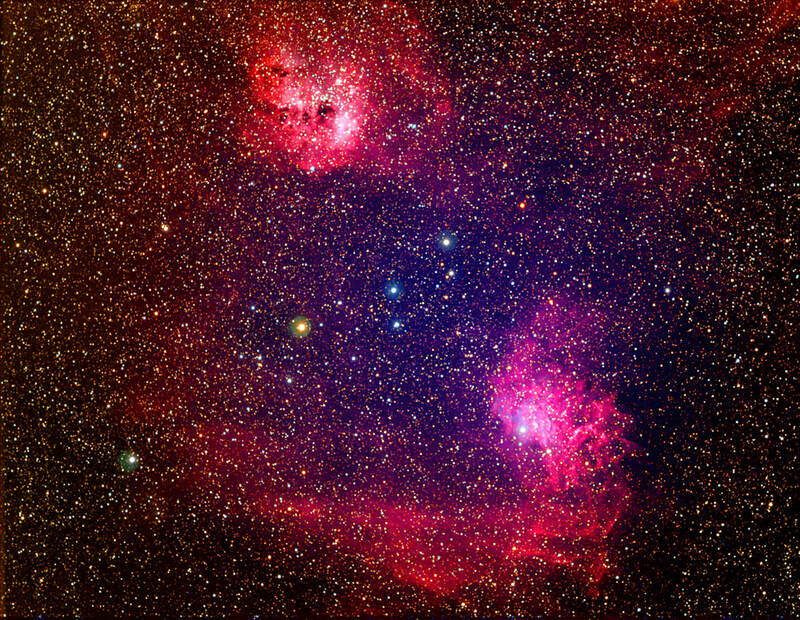 Here Gendler's technique of layering the Ha (75%) and Red (25%) images as an enhanced red image (in Photoshop) was used (see his web site at http://www.robgendlerastropics.com ). The resultant images were then combined in MaximDL. As Gendler notes, this is a somewhat better way to use the contrast of the H-alpha image (ionized hydrogen compromises a narrow width of the red band) while better preserving the actual color of the image (the previous image of NGC 7000 required a great deal of re-colorizing in Photoshop because of the washed out red effect when assembling the image as a Ha (as the L channel), R, G and B in MaximDL. Imaged with an SBIG STL-11000, using the Tak-106 with Paramount ME. Imaging performed with John Smith's CCDAutoPilot, using CCDSoft for camera control (-25 deg C), with 4 separate sets of 2x2 binned 10 minute Ha, R,G, and B images (20 darkframes assembled for reduction). (KBQ, 11/08/04). Note: Astro-photography sites like Gendler's and John Smith's are an invaluable learning tool. This version of the Horsehead Nebula was processed using Gendler's technique of layering the Ha (75%) and Red (25%) images as an enhanced red image (in Photoshop). Genler discusses his technique at his web site, http://www.robgendlerastropics.com/ (the photographs are increadable and a good deal of useful imaging techniques are described). Using his technique, no color management of this image was necessary, in contrast to the previous image, which required a great deal of management. The resultant images were then combined in MaximDL. Again, as Gendler notes, this is a somewhat better way to use the contrast of the H-alpha image (ionized hydrogen compromises a narrow width of the red band) while better preserving the actual color of the image (the previous image of the Horsehead Nebula required a great deal of re-colorizing in Photoshop because of the washed out effect on the red channel when using the Ha image in the L channel.. Imaged with an SBIG STL-11000, using the Tak-106 with Paramount ME. Imaging performed with John Smith's CCDAutoPilot, using CCDSoft for camera control (-15 deg C), with 6 separate sets of 2x2 binned 10 minute H-alpha, R,G, and B images (20 darkframes assembled for reduction). (KBQ, 11/08/04). 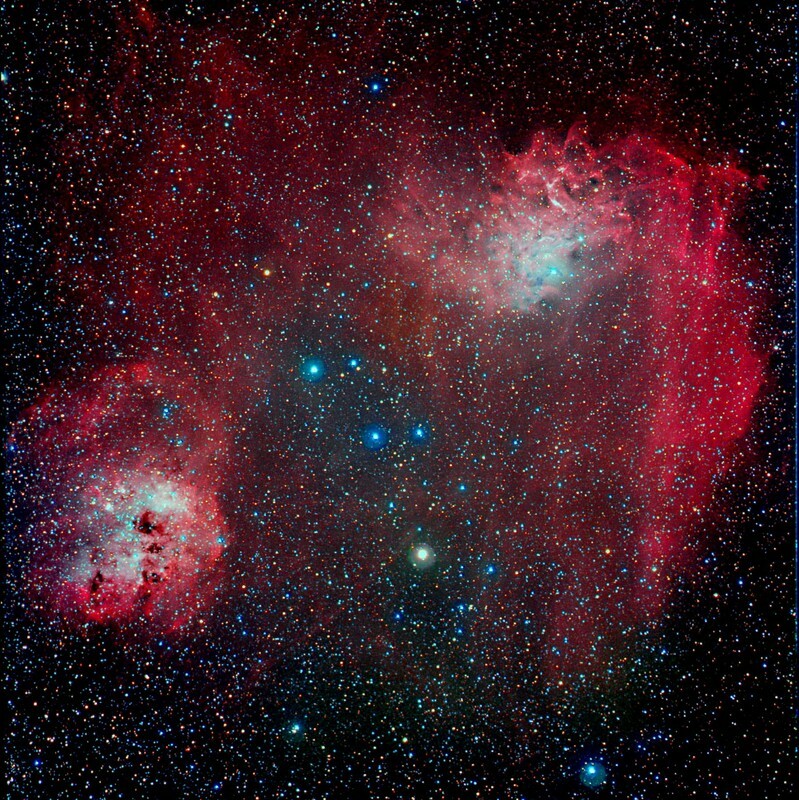 Flaming Star Nebula (IC 405) and associated emission nebula and open star cluster IC 410 (bottom left). Processed using Gendler's technique of layering the Ha (75%) and Red (25%) images as an enhanced red image (in Photoshop). The combined Ha/Red image was used both as an enhanced red channel and as a 30% Luminescence channel. Imaged with an SBIG STL-11000, using a Tak-106 FSQ with Paramount ME. Imaging performed with John Smith's CCDAutoPilot, using CCDSoft for camera control (-20 deg C), with 9 separate sets of 1x1 binned 10 minute H-alpha, and 9 separate 10 min 2x2 binned R,G, and B images (20 darkframes assembled for reduction for both 1x1 and 2x2 images). (KBQ, 12/04). Note: Image is grainy due to a unrecoverable processing error with Mira (user error, not program error!!) while doing dark subtractions. Proper calibration (dark subtraction, flat frames, registration) are critical if one wishes to optimize the signal to noise ratio. As promised, the same nebula with better calibration. 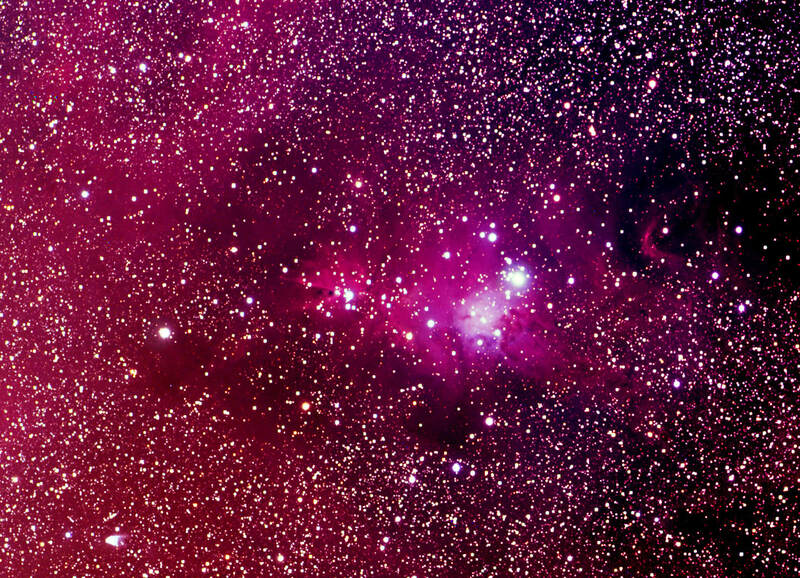 Flaming Star Nebula (IC 405) and associated emission nebula and open star cluster IC 410 (bottom left). Processed as an Ha(100%)RGB image with Maim DL Digital Development and Adobe Photoshop. Imaged with an SBIG STL-11000, using a Tak-106 FSQ with Paramount ME. Imaging performed with John Smith's CCDAutoPilot, using CCDSoft for camera control (-20 deg C), with 9 separate sets of 1x1 binned 10 minute H-alpha, and 9 separate 10 min 2x2 binned R,G, and B images (20 darkframes assembled for reduction for both 1x1 and 2x2 images). (KBQ, 01/01/05). Note: Somewhat less grainy than the previous image. Calibration with Mira AP, this time without any overt errors on the users part. Compared to the previous image the stars are much more rounded and there is less "grain" in the image. The next rendition will utilized Gendler's technique of Ha and Red channel mixing. 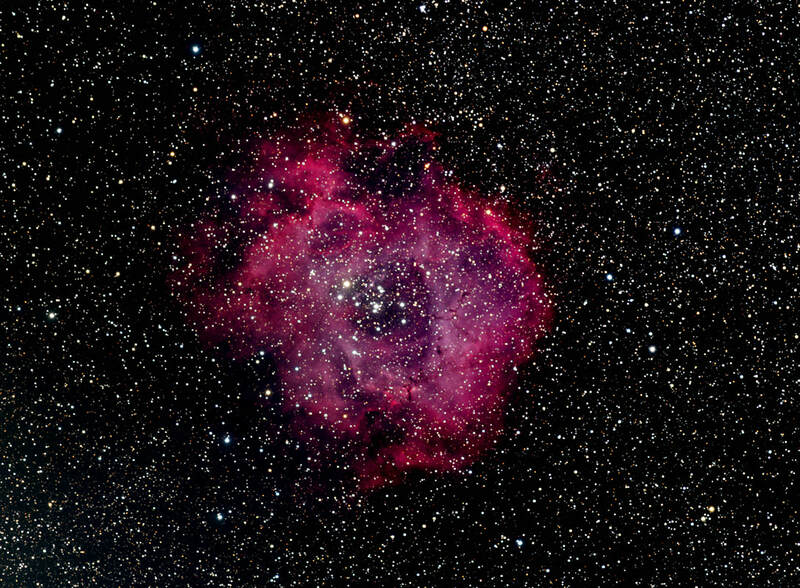 Pixilation is an issue and will be discussed with Rosette nebula image. 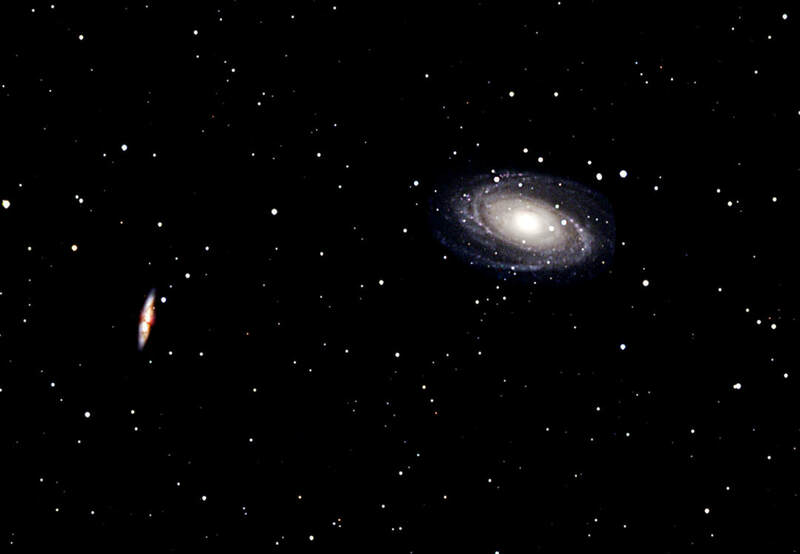 M81 and M82 in Ursa Major. Imaged with an SBIG STL-11000, using a Tak-106 FSQ with Paramount ME. Imaging performed with John Smith's CCDAutoPilot, using CCDSoft for camera control (-20 deg C), with 9 separate sets of 1x1 binned 10 minute Clear, and 9 separate 10 min 2x2 binned R,G, and B images (20 darkframes assembled for reduction for both 1x1 and 2x2 images). (KBQ, Jan 27, 2005). Note: The outside temperature was -25 degrees Celsius. A Kendrick dew zapper was needed to mitigate lense pinching and image distortion. A very slight remant of this is still visable. More vigorous use of the heating elements will likely completely reverse this problem. I have only seen this at about -20 degrees Celsius or below (there are no ways to manually adjust the Takahashi 106 FSQ (ie, no user set screws, as are present on some Borg and astroPhysics refractors. Fortunately we believe the heating elements will keep the aluminum OTA from pinching the lense. The optics and focusing mechanics of the Tak are so good that it is hard, but not impossible, to complain about this problem. 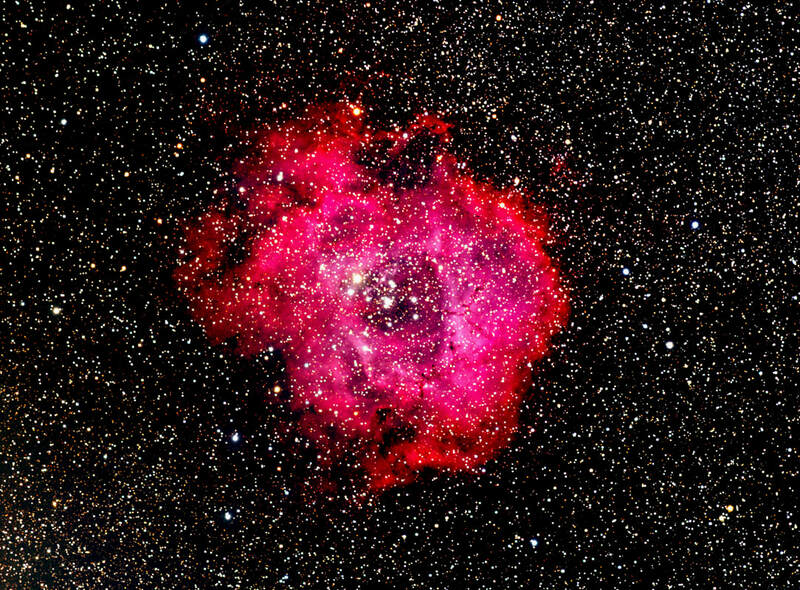 Rosette Nebula (NGC 2337-2339) in Monceros, 4900 light years distant. An emmission nebula with a number of associated open star clusters, including NGC 2244, within the center. Processed using a variation of Gendler's technique, layering the Ha (80%) and Red (25%) images as an enhanced Luminescent image (in Photoshop). The combined Ha/Red image was used both as an enhanced Luminescent (30%) with standard R,G and B channels. Imaged with an SBIG STL-11000, using a Tak-106 FSQ with Paramount ME. Imaging performed with John Smith's CCDAutoPilot, using CCDSoft for camera control (-20 deg C), with 12 separate sets of 1x1 binned 10 minute H-alpha, and 12 separate 10 min 2x2 binned R,G, and B images (20 darkframes assembled for reduction for both 1x1 and 2x2 images). (KBQ, 1/30/05). Note: Learned of a major error afffectng ALL the previous images. I was using Adobe's Image/Resize Image in order to change the print size to 6x4 inches (ie, keep it on the page). I was then using the "resample image" option, which caused SEVERE pixilation on zooming in. Now I change the "document size" but I DON'T "Resample". Usually I end up with a 4008 x 2672 pixel image which has a document size oof 6x4 and a resolution of 668 pixels/inch. This is a variation of the previous image. Here, the H-alpha and Red channels were processed under Pixel Math in Maxim DL (20% Red and 20% H-alpha). The concept comes from John Smith. It results in stars with a less mottled appearance then the provious image. These stars pixilate a bit more, and would likely benefit from a more expert image processer. The combined Ha/Red image was used as an enhanced Luminescent (30%) with standard R,G and B channels. Imaged with an SBIG STL-11000, using a Tak-106 FSQ with Paramount ME. Imaging performed with John Smith's CCDAutoPilot, using CCDSoft for camera control (-20 deg C), with 12 separate sets of 1x1 binned 10 minute H-alpha, and 12 separate 10 min 2x2 binned R,G, and B images (20 darkframes assembled for reduction for both 1x1 and 2x2 images). (KBQ, 1/30/05). Note: The key points from my perspective are: 1) Processsing H-alpha (or other narrow-band filter) enhanced images is challenging. There are many ways to process the data, each with it's own strengths and weaknesses. and 2) Maxim DL has many useful features, such as Pixel Math combining (as noted above) which are not available in an equivilent form in Adobe CS (which is, of course, an amazingly powerful program in it's own right). This is yet another variation of the previous image. Again, the H-alpha and Red channels were processed under Pixel Math in Maxim DL (80% Red and 20% H-alpha). What's different is the image was less aggressively processed with Adobe CS. Also, the histogram tool (levels) in Adobe CS was used, in addition to the "curves" tool. The idea was to keep the image from oversaturating, hopefully giving it a somewhat more "realistic" look (ie, less of an "over-processed" look). The combined Ha/Red image was used as an enhanced Luminescent (30%) with standard R,G and B channels. Imaged with an SBIG STL-11000, using a Tak-106 FSQ with Paramount ME. Imaging performed with John Smith's CCDAutoPilot, using CCDSoft for camera control (-20 deg C), with 12 separate sets of 1x1 binned 10 minute H-alpha, and 12 separate 10 min 2x2 binned R,G, and B images (20 darkframes assembled for reduction for both 1x1 and 2x2 images). (KBQ, 1/30/05). Note: The key point here is that it is easy to over process an image. In fact, it is difficult to resisit the temptation to do so. A good trick I got from John Smith is to use the Adobe CS eye dropper tool and make sure you are NOT oversaturating any part of the image as you process it. Also, the histogram (levels) tool in Adobe is great for bringing out the mid-range light (grey-zone arrow), while avoiding oversaturation of the brighter areas (far right arrow of the levels tool). Cone Nebula in Monceros. This nebula is in the southern part of the open star cluster NGC 2264 (Christmas Tree Cluster). Processed using a layered Ha (20%) and Red (80%) image as an enhanced Luminescent image (in Photoshop). The combined Ha/Red image was used both as an enhanced Luminescent (30%) with standard R,G and B channels. Imaged with an SBIG STL-11000, using a Tak-106 FSQ with Paramount ME. Imaging performed with John Smith's CCDAutoPilot, using CCDSoft for camera control (-20 deg C), with 12 separate sets of 1x1 binned 10 minute H-alpha, and 12 separate 10 min 2x2 binned R,G, and B images (20 darkframes assembled for reduction for both 1x1 and 2x2 images). (KBQ, 2/20/05). Note: The layering technique can be used in a variety of ways. In this case the Ha channel makes up only 20% of the L channel, giving the stars a more natural appearance, while preserving the ability of the H-alpha channel to "bring out" some of the details within the nebula. A better process image will be forthcoming.